September is one of California's best months. Summer coastal fog retreats, temperatures moderate and summer's crushing tourist crowds disappear around this time. On California highways in September, especially in the Central Valley, be on the lookout for truckloads of bright red tomatoes headed for the canning plant and loads of garlic shedding its paper-thin skin along the highway going to Gilroy. Dry-farmed Early Girl tomatoes also show up at farmers markets on restaurant menus. Deliberately deprived of water while growing, these concentrated bits of goodness are enough to send California foodies into a feeding frenzy. In fact, they could redefine your idea of a good tomato forever. The weather in California varies depending on what part of the state you're visiting. In general, the entire state starts to cool off and clear up in September. Highs in some places range from the 70s to the 90s (with some places reaching the 90s and low 100s), and lows across the state don't typically dip below the low 60s or mid-50s. The Central Valley, parts of the Central Coast, and inland areas around Los Angeles can get pretty hot (but still be tolerable). Unless you're a heat-seeker, though, it's best to avoid Death Valley, Palm Springs, Joshua Tree, and the rest of the California desert until late in the month when things cool off a bit. Lake Tahoe, on the other hand, starts getting cold with lowest temperatures dipping to near freezing (though highs stay in the high 60s to low 70s). You can get details of the highs and lows around the state in September (and all year round) by consulting these guides to some average highs, lows, and more weather considerations in some popular tourist destinations, such as San Diego, Los Angeles, Disneyland, Death Valley, Palm Springs, San Francisco, Yosemite, and Lake Tahoe. Because there are so many things to do in California during September, and they happen everywhere from the desert to the mountains, your packing list will vary depending on what you're doing. These are a few things to keep in mind. By September, water and air temperatures at the beach will limit most people to oceanside strolls and quick barefoot dips in the surf, but you should know that the beach areas are always colder than inland and they get even chillier when the sun goes down. If you plan on spending time outdoors camping or hiking, pack light layers to stay warm and covered (but ones that you can easily shed if it gets too hot), and bring appropriate footwear. No matter where your plans take you, pack plenty of sunscreen, as the sun shines almost every day in September. Don't you love it that summer begins and ends with a three-day holiday weekend? Always observed on the first Monday in September, Labor Day is dedicated to the social and economic achievements of workers. That makes it a good time to take the day off from all that work to relax and play with friends and family. To get some ideas about what you can do over the long weekend, check out the guide to Labor Day fun in California. September is California Wine Month. 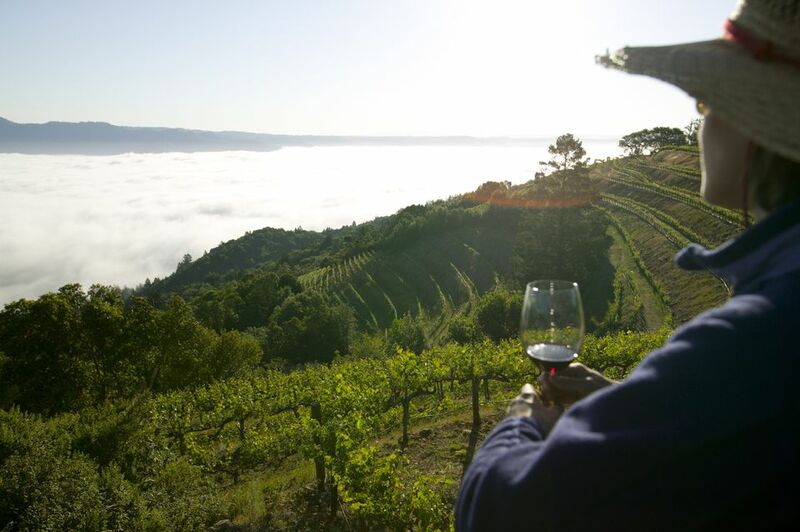 You probably think of Napa or Sonoma first when someone says California wine, but this would be a very good time to check out some of the other great wine-growing regions, too. California lobsters are called "spiny lobsters"—you'll know why when you see one. They have smaller claws than their Atlantic coast cousins, but many Californians love them just the same. The lobster-catching season starts near the end of September, and you'll find meals featuring them on menus in their Southern California range, which extends from San Diego up to San Luis Obispo. Go Whale Watching in September. This is a good time to see blue whales, humpbacks, and Minke whales. If you are in the state in September, consider attending one of these popular events. The Los Angeles County Fair runs through most of September. It's one of the state's biggest and most elaborate county fairs, held in Pomona. The Monterey Jazz Festival kicks off mid-month, with an always-outstanding lineup of great musicians. It's almost always a sellout, making it a good idea to buy tickets at least two weeks in advance. Grape Harvest Festival, Lodi: A family-oriented festival to celebrate the harvest. International Dragon Boat Festival, San Francisco: The boats are gorgeous, and admission is free. California International Airshow, Salinas: It's been going on since 1980 and is always popular. Tall Ships Festival, Dana Point: An excellent opportunity to see those beautiful, tall-masted sailing ships. Surf City SurfDog Competition, Huntington Beach: Dog owners from around the world, bring their pups to "Hang 10" in this surfing competition where the dogs are the contestants. Arena seating and single day tickets for the Monterey Jazz Festival go on sale in July, and they often sell out by late August. Find out all about it in the Monterey Jazz Festival guide. If you want to go camping at a California state park in September, make your reservations six months ahead of time in March. Everything you need to know is here. If you're planning to camp at Yosemite next August 15 through September 14, finish that tax return early and be ready at 7:00 a.m. Pacific Time on April 15 to make your reservations online. For camping September 15 through October 14, it's May 15. You can do that online or by phone at 877-444-6777 or 518-885-3639 from outside the US & Canada. Get an overview and more options here. September is a good time to get busy exploring more things to do in California in the fall or to start thinking about that perfect California fall getaway.